What?! Now two of the three Musketeers are women! They drive cars, instead of riding horses! This is another one of the compelling free movies to watch online. Alexandre Dumas’ book, “The Three Musketeers” has been adapted countless times in theatre productions, musicals, motion pictures, video games, and other mediums. A lot have adapted it to the letter, while some have put different spins on the story. The movie “3 Musketeers”, released on October 25, 2011 and directed by Cole McKay, certainly created something new while still remaining true to the spirit of brotherhood and swashbuckling action of the original. The original story was set in a different time… not decades ago, but centuries. The film being set in our current world, shows how modern technology and culture have been incorporated into the scene. Advances in mass communications, medicine, transportation, clothing, and lots more alter the overall plot. Purists may not like it, but others may find it as a fresh change of pace. 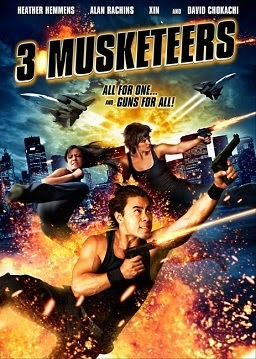 Interestingly, this film decided to change the gender of two of the musketeers. d'Artagnan and Aramis are now women in this story. Though it’s more complicated to figure out their motivations now even though the same characteristics are set for each character. Although Athos and Porthos remain male as they were in the original, drawing parallels between how they act in the movie and how they act in the books could be difficult, as they are adjusting to women as fellow musketeers. In the film, societies have changed, and so have the conflicts. As the movie is set in a different type of society from the original novel, the points of conflict have also changed; those familiar with the novel can watch the movie to compare for themselves. Viewers can also find novelty in the weapons used. Pistols and guns replace swords, while cars take the place of horses. Changes done in adaptations create an opportunity for the same story to be told in a new way. If you’re in the mood to see a classic with a twist, watch “3 Musketeers” anytime, anywhere through the trusted streaming website viewlorium.com. Trust us, you’re in for some awesome entertainment.